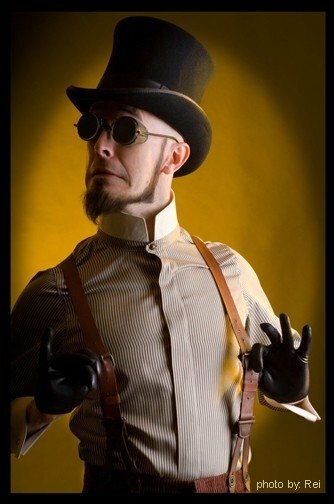 Dr. Steel is a scene-stealing persona, clad either in the labcoat of a mad scientist or in the gentlemanly accoutrements of the 19th century. His music is a fusion of dance, hip-hop, rap, swing, big band and opera, and played live on stage to the accompaniment of puppetry and theatre. As well as being a musician he is an artist and even has his own online TV show. The man just cannot be neatly and cleanly defined and stuffed into a box, which has made him a beacon to many youth the world over. In fact, his fans—the cast aside, the down trodden, those square pegs of society who do not fit into round holes—have gathered around him in the so-called ‘Army of Toy Soldiers’. While other personalities take advantage of disenfranchised youth, Dr. Steel has taken the opportunity to do good with his fans, by encouraging them to have fun! They are—he says—not an army of destruction, but creation! Rather than channeling anger and frustration into violence, Dr. Steel encourages his fans to be creative, think outside the box, be proud of their differences and to help their community. There are local groups of Toy Soldiers all across the United States, here in Canada, in England, France, Germany and elsewhere. Recently I had an opportunity to talk to the good Doctor via his new distance-conference-imagizer. Through a slight haze of static I could see Dr. Steel reclining in an ornate Elizabethan chair, wearing a red smoking jacket. His retro motorcycle goggles obscured his eyes, and fuzzy pink bunny slippers adorned his feet. After a small wind up robot glided on screen to deposit a plate of milk and cookies on his end table we began. Carnival and circus influences can be felt, heard and seen in your music. How did this come to be? STEEL: Ah, yes indeed. Well I have always enjoyed the calliope madness of carnivals and find that mixing such themes with contrasting elements such as modern percussive beats proves quite interesting. For me, contrast is everything in all mediums and this is but one aspect of my work. I enjoy many styles of music and I hope that putting them together in interesting ways results in something original and entertaining. Where did your fascination with toys come from? STEEL: As a child, toys were the main focus of course. Play was the most important thing. As I grew older I began to realize that it’s only the form of toys that change. We’re still working to pay for those things that make us happy. We’re still trying to find those objects that capture the creativity and imagination of childhood. Toys aren’t the solution but they’re an important stepping stone in realizing that imagination and creativity are the most important aspects of existence. When and how did you enter into public performance? STEEL: Oh goodness, many years ago. I began performing on the street as a matter of fact. Small shows utilizing whatever resources I had at the time evolved into larger shows, wherein I am still utilizing whatever resources I might have. My performances and all aspects of my creations continue to evolve and expand as time goes by. I look forward to the possibilities of what the future shall bring so that I may continue to reach new levels of creation. What has been the general reaction from Q Public to you and your music? STEEL: The internet is interesting and very powerful. When I launched my website, I was then truly able to present my ideas to the world. I am constantly impressed with the massive amounts of creative feedback that I receive on a daily basis. There are so many people out there who have talents to share with the world. I am honored to know that my work has helped to unleash and encourage such imagination. Many of these creators have united under the banner of The Army of Toy Soldiers and this community reaches across the globe. It is certainly very inspiring to witness. It has since evolved into a very powerful force, driven by people who are talented and eager to see more imagination and fun appear in the world. They are true visionaries indeed. What is your greatest technological achievement? Your biggest disaster? STEEL: Robots. On one hand, the development of functional mechanics is a success, but on the other hand…the malfunctions are quite frequent. I look forward to overcoming these technical difficulties in the future. What do you do with your time when you are not performing, writing or building robots? STEEL: As I mentioned, my purpose is to create. Being in the situation that I am, with the goals that I have dedicated my life to, demands absolute obsessive dedication. There is no spare time in my life. I am working every moment of the day so that I might find myself in a position to obtain more resources to expand and realize my creative vision. Loss seems to be a recurring theme in your music. Is this a subject that resonates with you? STEEL: It’s a theme that resonated with me, but more importantly it is a theme that resonates with my listeners. Many of us feel that the world is not as it should be, that there is something missing from our lives. I believe that much of this is the loss of our childhoods, or more specifically, the lack of imagination and creativity that we are able to exercise on a daily basis. Music is a language that speaks to people in very unique ways and this message continues to ring true in the minds of the many. I only hope that it encouraged them to create as well. Finally, what is your favourite kind of cookie? STEEL: Oh my, that is a most difficult question. I love so many of them…I think I shall take one of each, please. great interview! some good questions and insights were shared here. i hope to see more interviews with the Doc in the future.